Your wedding style shouldn’t stop with your attire! 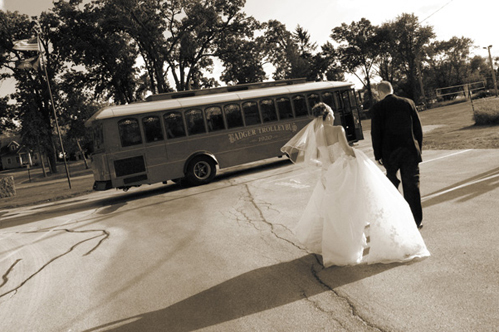 From a trolley or limo for the wedding party to a shuttle bus for guests, a set of wheels makes a big impression and helps your wedding day run smoothly. Plus, if you leave the driving to the pros, you’ll have one less detail to worry about. Check out these transportation companies that cater to Southeastern Wisconsin. Note: The contents of this guide were checked for accuracy when this article was updated on April 15, 2013 at 8:17 p.m. We continually update the articles on WedInMilwaukee.com, but it’s possible some details, specials and offers may have changed. As always, we recommend you call first if you have specific questions for the businesses mentioned in the guide. Special Feature: Three trolley models to choose from. Did we miss a local transportation company? Let us know in a comment below, or email us! You can also check out MKE Shuttle for wedding day transportation needs. Best prices and vehicles in the Milwaukee area.